Wed., Jan. 4, 2017, 10:20 a.m. The two parents sitting across from Al Falkner are desperate. It’s the middle of the Great Recession and they both have been laid off from their high-paying engineering jobs. “They had the car, the house, the kids in private education – they had their life all set, and then the bottom fell out,” Falkner said. After losing so much, those parents didn’t want to lose Gonzaga Prep, too. 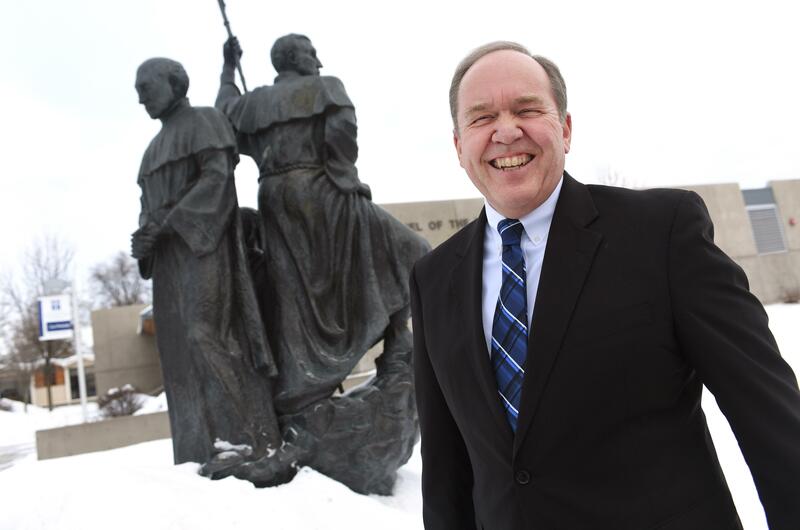 Falkner, Gonzaga Preparatory School’s president since 2004, will retire in June. He started working at Gonzaga Prep in 1974 as an English teacher and baseball coach. He became principal in 1995 and then president. Over the years, he’s seen the school change, physically and demographically. And one of the biggest changes was how and what families pay. Twenty-five years ago, Falkner said, everyone paid the same amount. Often that meant middle-class families couldn’t afford to send their children to Gonzaga Prep, while poorer families could with the help of financial aid and scholarships, as could wealthy families. “The perception was you were very wealthy or you had total financial aid,” he said. That changed with the implementation of the Fair Share Tuition program. Now, Falkner said, the amount of money families pay is dependent on what they make. Currently, about 60 percent of students use the program. So, when the recession decimated many incomes, Gonzaga Prep adjusted. The school lost nearly $700,000 that year, but Falkner said alums and benefactors helped the school through. That adaptive ability has been an intentional aspect of Falkner’s leadership style. Pointing to the school’s Jesuit mission, Falkner emphasizes the importance of preparing students for the modern world, while keeping some of the sanctity of the Catholic faith. Falkner was a teacher at Gonzaga Prep when the school started accepting women in 1975. A graduate of Central Valley High School, Falkner said that transition wasn’t too difficult for him. “We went from a school of 600 boys to a school of 1,000 boys and girls,” Falkner said of that year. Falkner believes one of the most important things that Dougherty can do is tell Gonzaga Prep’s story, a story that can be for everyone, Falkner said. Falkner’s wife will also retire in June from her teaching job at Assumption Parish School. The two plan to travel internationally and spend time with their three children and two grandchildren in Portland. Published: Jan. 4, 2017, 10:20 a.m.